This is the annual PUBLIC SAFETY UPDATE. The Honorable Mayor Halliday, City Manager McAdoo, Police Chief Koller, and Fire Chief Contreras will be presenting on this evening. Please join HNA's Block Captains, neighborhood leaders, residents, and business owners at this important community meeting. Get a better understanding of public safety, where we are now, and how we did in 2018. Meet your City officials and District Operations staff. 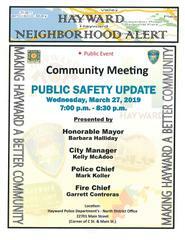 We want to partner with you in 2019 to improve crime and safety in Hayward!